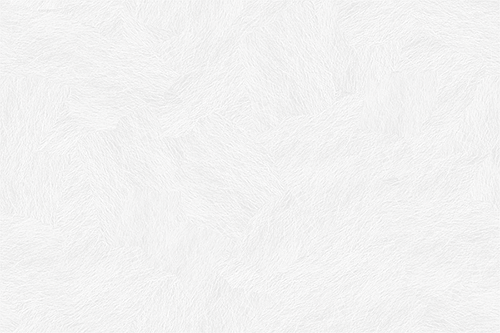 This month we bring you all of this! 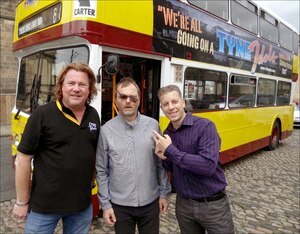 WIN TWO TICKETS TO TYNEIDOLS COMEDY BUS TOUR WITH ‘HIM OFF THE VIZ’ SIMON DONALD PLUS AUF PET GOODIES! 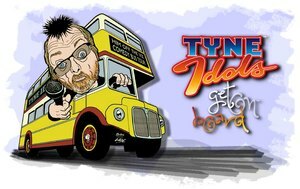 The Official Auf Wiedersehen, Pet Fansite has teamed up with ‘TyneIdols’ to offer one lucky winner two complementary tickets to a very special one-off comedy bus tour hosted by North-East legend and Viz magazine co-editor ‘Simon Donald’! Bring your own nibbles, and drinks (no glass) and join Simon and the TyneIdols Team on an unforgettable three-hour tour around Newcastle with hilarious tales of growing up, creating the Viz Comic and hear his stand-up routine with mad characters, songs and anecdotes whilst travelling through some of the locations featured in the timeless history of Viz Magazine! This very special tour takes place on Thursday 25th August at 19:00 departing from Bewick Street opposite the Central Station, Newcastle and promises to be a fantastic insight into this fabulous magazine. One lucky winner chosen at random will receive 2 tickets for the TyneIdols Comedy Bus Tour hosted by ‘Him off the Viz’ Simon Donald plus an official Auf Wiedersehen, Pet Classic Logo white tee-shirt! 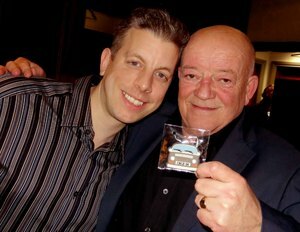 And five runners up will each receive an Auf Wiedersehen, Pet Classic Logo keyring! To be in with a chance of winning, simply drop us a line at competitions@awpet.com with the correct answer no later than 9pm on Sunday 21st August 2016. “LOOK… I’M STILL THE GAFFER SO GET GANNIN!" It wasn't a role he relished but one he unconsciously adopted from the opening scenes of series one. Dennis Patterson took the weight of the world on his shoulders and went on to become known and respected as the ‘the gaffer’ and voice of reason throughout four fantastic series plus one special. This unforgettable classic quote featured in Series 2, Episode 7 captures the sharp authoritative yet respected dialogue between Dennis and Oz following the completion of conversion work to Thornely Manor prior to their onward travels to Spain. 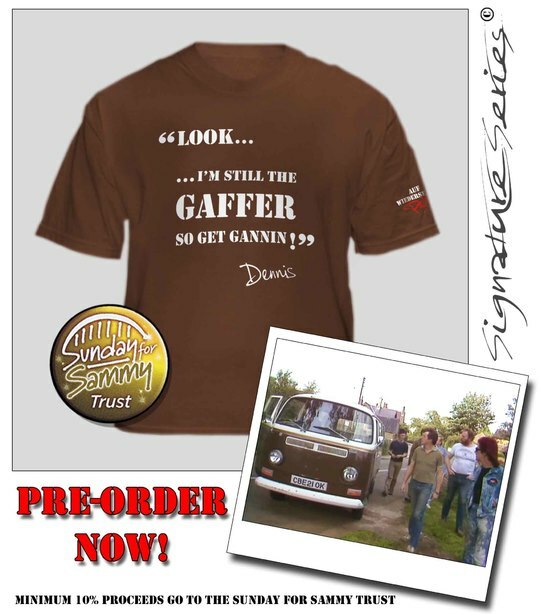 Our brand new high quality ultra-cotton tee-shirt beautifully compliments our Signature Series range whilst echoing the colour of Den’s trusty VW Campervan. The striking crisp digital screen print to the front in bold white is manufactured to the highest standards with the traditional classic logo to the sleeve for that extra touch of class. As one of our valued newsreaders, we’re offering you the opportunity to pre-order before anyone else, guaranteed to be despatched by Friday 26th August. We recently caught up with Auf Wiedersehen, Pet Series Producer Martin McKeand to bring you an exclusive in-depth interview. Martin tells us how he got involved in Auf Wiedersehen, Pet, what his role as Producer entailed and how he met and worked alongside Director Roger Bamford. Martin also talks about casting the magnificent 7, how ATV (later Central TV) were embarrassed to promote the first series and opens up about some of the problems encountered during the production of the second series given Union problems and the sad untimely passing of Gary Holton. “See that man with the beard and the tie?” That’s ‘Series Producer’ Martin McKeand making his cameo in Auf Wiedersehen, Pet Series 2, Episode 12, ‘For Better or Worse’! Read Part 1 of our interview with Martin here and don’t forget to check our part 2 in our forthcoming newsletter.